We manufacture plain steel and wound strings for musical instruments. If you are looking for prepackaged string sets for electric guitar, electric bass guitar, etc. please check out G.H.S. Strings or S.I.T. .
We are a custom shop and manufacture strings based on the information you provide to us when you place an order. We give each customer's order our full attention and when we receive many orders, it may take some time to complete your strings. This is because we process each customer's project in the order in which it is received. This "turnaround" time can take anywhere from one day to 8 or 9 weeks, depending on how many orders we have received prior to yours. 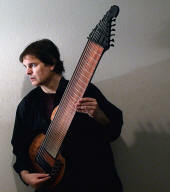 Most of our customers are professional musicians, luthiers, or musicians developing experimental instruments. to, but could never attain with conventional strings. 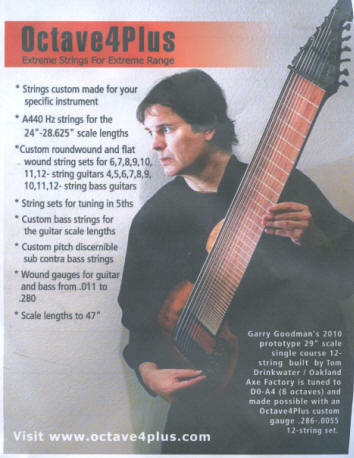 and G4, the upper octave G on the electric 12-string guitar. ever tried to reach A440 only to have that string snap? to develop a string that could tune to Ab4 at the 32"
available for the Floyd Rose system. Please allow 1 - 10 weeks depending on what you order and the amount of orders placed ahead of yours at the time you order. You must fill out the string design specification form located at the bottom of each page when ordering! All orders and payments not accompanied by the string design specification form will be rejected! We are a custom string shop. Nothing we make is prepackaged, just waiting to be drop-shipped. When you click on You are ordering custom made strings. If you fail to submit the design specifications for the custom strings you have ordered (forms located at bottom of each order page) within 48 hours from the time you submit payment, you will be issued a credit which is good for 45 days and is not refundable. We reserve the right to refuse service to anyone and at anytime. 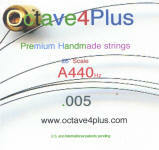 Look for Octave4Plus™ in Guitar Player and Bass Player Magazines.